When we cook at home, and want to clone the flavor of food like Taco Bell's, it takes no extra effort to make the meal significantly lower in fat than what you get at the restaurant. Why not give this recipe a go? You'll soon find out these tacos taste just like the soft tacos you get from the world's largest Mexican food chain, but with only one-quarter of the fat. Source: Top Secret Recipes Lite by Todd Wilbur. 1. In a medium bowl combine the ground beef with the flour, salt, minced onion, paprika, chili powder, garlic powder, and onion powder. Use your hands to thoroughly incorporate everything into the beef. 2. Preheat a skillet over medium/low heat and add the ground beef mixture to the pan along with the water. Brown the beef mixture for 5 to 6 minutes, using a wooden spoon or spatula to break up the beef as it cooks. 3. Using the microwave, heat up the fat-free flour tortillas wrapped in a moist cloth or paper towels, or use a tortilla steamer. Heat for 25 to 30 seconds, or until hot. 4. Spoon about 3 tablespoons of the beef mixture into the center of one tortilla. 5. Place about 2 tablespoons of shredded lettuce on top of the beef. 6. 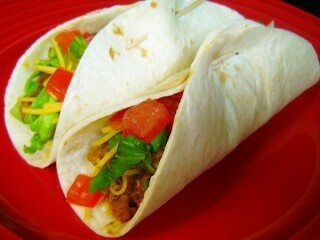 Finish the soft taco by spreading about a tablespoon of shredded cheese over the lettuce and fold. Repeat for the remaining tacos. Menu Description: "Wok-seared with Chang's barbecue sauce." 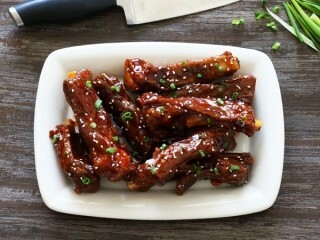 One of the most popular eats on P. F. Chang's appetizer menu is the Chinese spare ribs that arrive slathered with Asian-style barbecue sauce. The Asian flavor comes from the addition of sweet hoisin sauce to a fairly rudimentary barbecue sauce formula. Chang's menu says these ribs are spare ribs although they appear to be much smaller, more like baby backs. You can certainly use either for this recipe, just be sure to trim the ribs first, since the restaurant version is lean, clean ribs with no extra meat or fat hanging off. There are several ways to cook pork ribs—P. F. Chang's boils theirs first, then fries them. After that, the ribs are tossed with the sauce in wok and served piping hot. A serving of these ribs at the restaurant is 6 individual ribs, but since a full rack is as many as 12 ribs, this recipe will make twice what you get in a serving at the bustling bistro chain. Menu Description: "Made from scratch in our kitchens using fresh Grade A Fancy Russet potatoes, fresh chopped onion, natural Colby cheese and spices. Baked fresh all day long." In the late sixties Dan Evins was a Shell Oil "jobber" looking for a new way to market gasoline. He wanted to create a special place that would arouse curiosity, and would pull travelers off the highways. In 1969 he opened the first Cracker Barrel just off Interstate 40 in Lebanon, Tennessee, offering gas, country-style food, and a selection of antiques for sale. Today there are over 529 stores in 41 states, with each restaurant still designed as a country rest stop and gift store. In fact, those stores which carry an average of 4,500 different items apiece have made Cracker Barrel the largest retailer of American-made finished crafts in the United States. Those who know Cracker Barrel love the restaurant for its delicious home-style breakfasts. This casserole, made with hash brown-sliced potatoes, Colby cheese, milk, beef broth, and spices is served with many of the classic breakfast dishes at the restaurant. The recipe here is designed for a skillet that is also safe to put in the oven (so no plastic handles). If you don't have one of those, you can easily transfer the casserole to a baking dish after it is done cooking on the stove. Source Top Secret Restaurant Recipes by Todd Wilbur.